Best Eyeshadow Colors for YOUR Eyes! Hello beauties! Today I'm going to teach you about how to choose the best eyeshadow colors for your eye color. This gives a personal touch and creates that WOW factor! It's all about the color wheel. 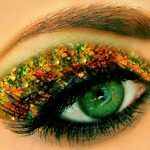 In a nutshell, whatever colors are directly across from one another on the color wheel are colors … [Read more...] about Best Eyeshadow Colors for YOUR Eyes!